Here’s a fantastic Tembang Sunda recording from 1935. The featured instruments are the zither called kacapi and suling, a bamboo flute. The singer, Nji Raden Hadji Djoeleha, embodies the old style of singing, higher pitched and nasal. The older style also uses different ornamentation, for example, jenghak, the use of the break between chest and head voice which can be heard on this recording. Tembang Sunda was originally known as Cianjuran, from Cianjur, the court city in west Java. It’s a form of poetic singing that emerged out of several other Sundanese genres, especially pantun, in the early 19th century and was promoted and enjoyed by the aristocracy. The songs glorify Pajajaran, the legendary Hindu kingdom of the 14th and 15th centuries. The other side of this record can be heard on Ian Nagoski’s “Black Mirror“, released by Dust-to-Digital. 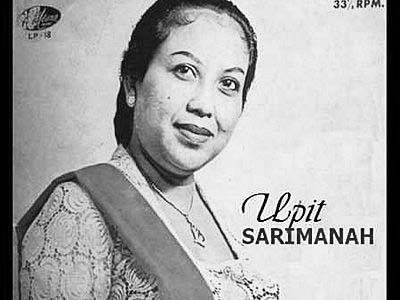 She was a versatile singer, recording in everything from pop styles to keroncong to traditional gamelan. 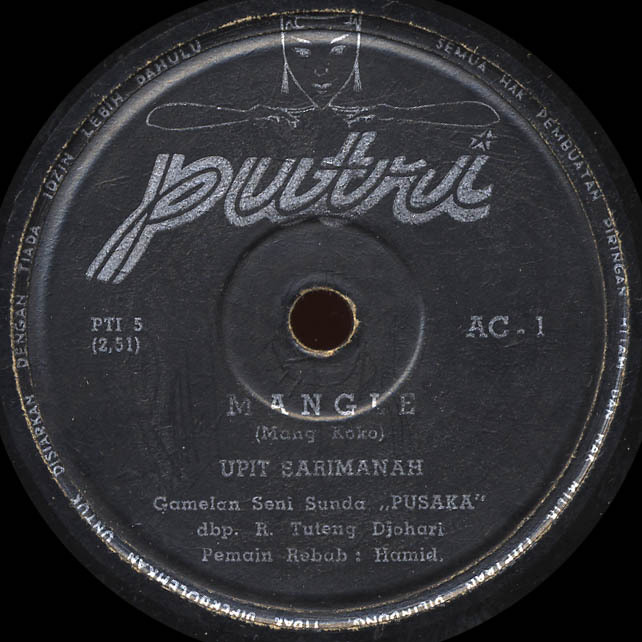 Upit first recorded 78s for the Nusantara label as well as the short lived Putri label, both offshoots of Radio Republik Indonesia (RRI). She went on to record many lps for Indonesian labels such as Mutiara, Canary, Evergreen, Lokananta and others. 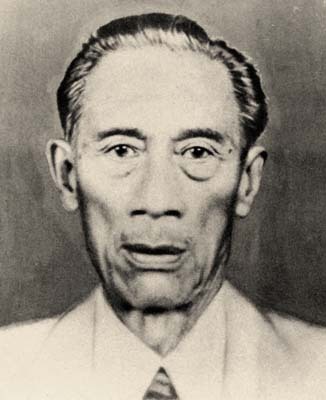 Mangle is the Sundanese name of the jasmine flower worn as a decoration in the hair of a bride during wedding ceremonies, but it also has a larger symbolic meaning of “sacred beauty.” The song was composed by Mang Koko Koswara (pictured below), a popular composer of the 1950s known for modernizing Sundanese music. Here are the lyrics in Sundanese if you’d like to sing along. This post is a bit of an update to my earlier post from Inner Mongolia. Hisao Tanabe, a Japanese musicologist, supervised the release of three collections of Asian music on 78 rpm record. The first was called Toa no ongaku (Music of East Asia) released in 1941 Nippon Columbia. 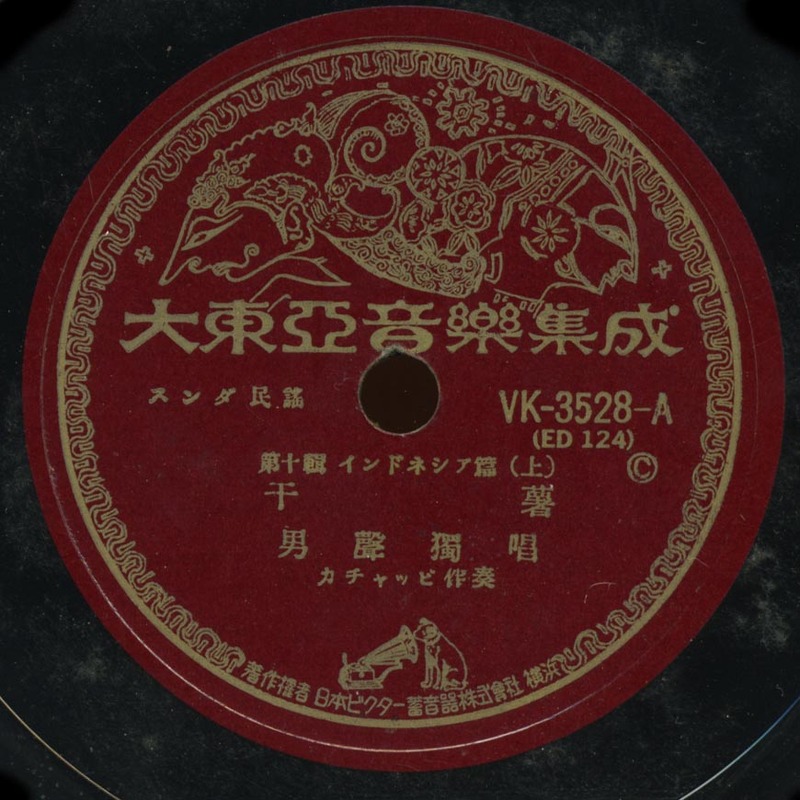 The second set, Nanpo no Ongaku (Music of the South) was relased in 1942 also by Nippon Columbia. 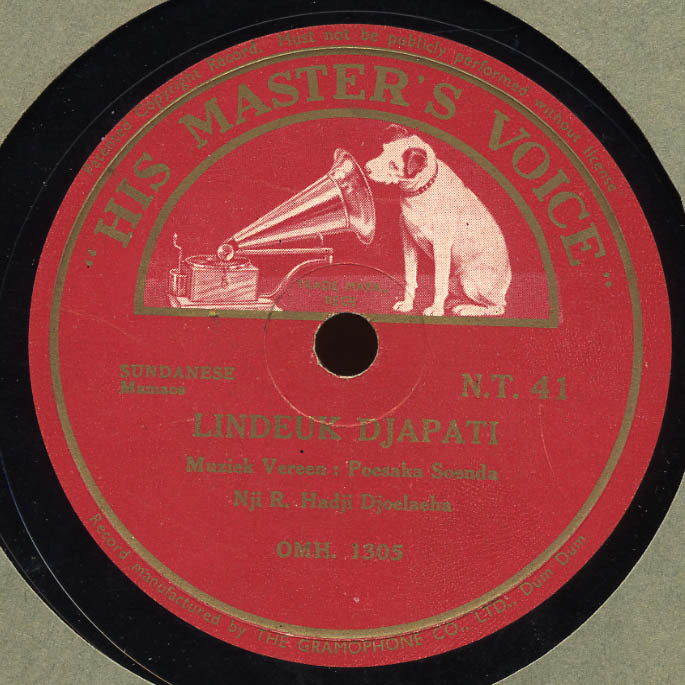 It was a set of six 78s that included music from around Southeast Asia. I’ve never seen any copies of either of these two collections. Give a shout if you have them! In the same month, another Tanabe collection was released by Nippon Victor called Daitoa Ongaku Shusei (A Greater East Asian Music Compilation.) This was an epic set of thirty-six 78 rpm records, divided by region into twelve albums of three records each. I have not managed to determine all the regions that are represented in this set, so far I have found two different albums from China, one from India and one from Indonesia, plus one of the three records from the Inner Mongolia album. 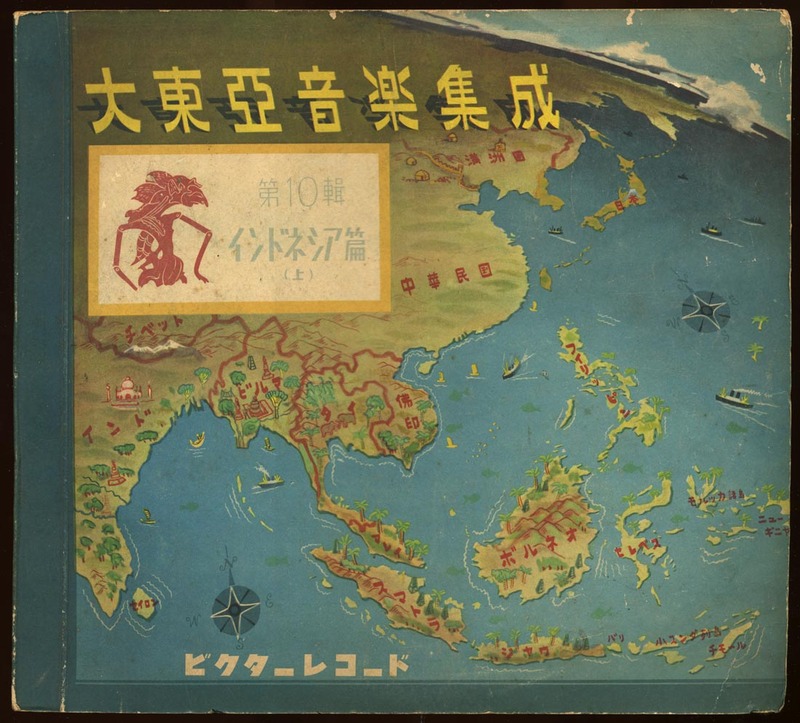 The cover of the Indonesian album, below, shows more than 12 regions, so it’s not clear if all these places are represented on the set. Tanabe theorized that all Asian musics had a common basis and that somehow Japan represented the purist expression, or culmination of “Asian music.” This philosophy meshed nicely with Japan’s imperialistic intentions. The sets he compiled were a kind of response to the famous Music of the Orient by pioneering ethnomusicologist Erich von Hornbostel, a set of twenty-four 78s released in 1931. Tanabe felt that Music of the Orient was too steeped in exoticism, yet his own theories are rife with racial stereotypes and musings about some intangible ancient “Asianess.” What makes matters stranger is that Tanabe went on to lift selections from Hornbostel’s collection and reissue them in his own! All the records on Tanabe’s sets were from previous releases. Hornbostel’s collection was really the first compilation of world music 78s, the prototype for Secret Museum of Mankind, Excavated Shellac, Haji Maji and others. It’s popularity is evidenced by the fact that it was re-issued by Decca and again by the English Parlophone label. Tanabe’s collections have never been fully reissued and his notes have yet to be translated into english. At least one side, from Inner Mongolia, was included on the Secret Museum of Mankind Central Asia cd. I don’t think anyone has determined where all the Tanabe records were originally issued. I suspect this one was from Beka. It features the Sundanese zither called kacapi, performing the epic poetry known as Tembang Sunda.